March is almost here, but we’ve got some cold weather to contend with before the springtime sunshine and temps (!!!!) come upon us. So, comfort foods are still a necessity for lots of people. Many of these dishes take time, which is fine, but sometimes you want that warm feeling in your belly without spending hours in the kitchen. I found an easy and delicious stovetop mac-n-cheese recipe that will solve the problem! This took about 10 minutes to make and definitely doesn’t taste like it. I added broccoli (would have added bacon too but didn’t have time to cook it – it would be fantastic in this! )…of course, you can sub any veggies or proteins you like. It’s hearty enough to be served as a main dish, but doable as a side, too. Kids will love it too…the hot sauce can easily be omitted if need be. Cook pasta according to package directions and drain. Return to the pot and melt in butter. Stir to combine. Whisk together the eggs, milk, hot sauce, salt, pepper and mustard. Stir into the pasta and add the cheese. Over low heat continue to stir for 3 minutes or until combined. Add broccoli and stir to coat. Serves 2-3 as a main dish, 4 or more as a side dish. 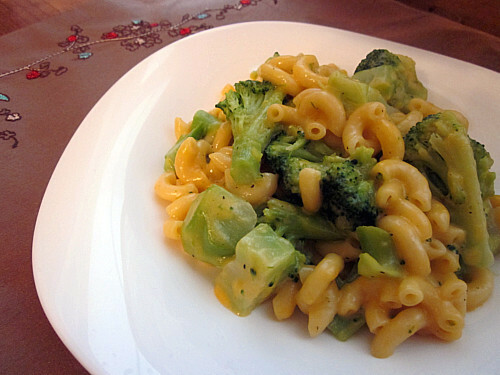 This entry was posted in broccoli, cheddar, main dishes, pasta, QuickAndEasy, side dishes. Bookmark the permalink. I’m all about mac and cheese with anything. Baked mac and cheese is so delicious it’s un-holy. We are on the same page. Yours looks so good and healthy! I love Alton Brown’s recipes. Oh yes. Definite comfort food. Broccoli is my favorite mac and cheese mix-in! Total comfort food… it looks cheesy and delicious.